West Side Architectural Iron Works / Van Tassel & Co. 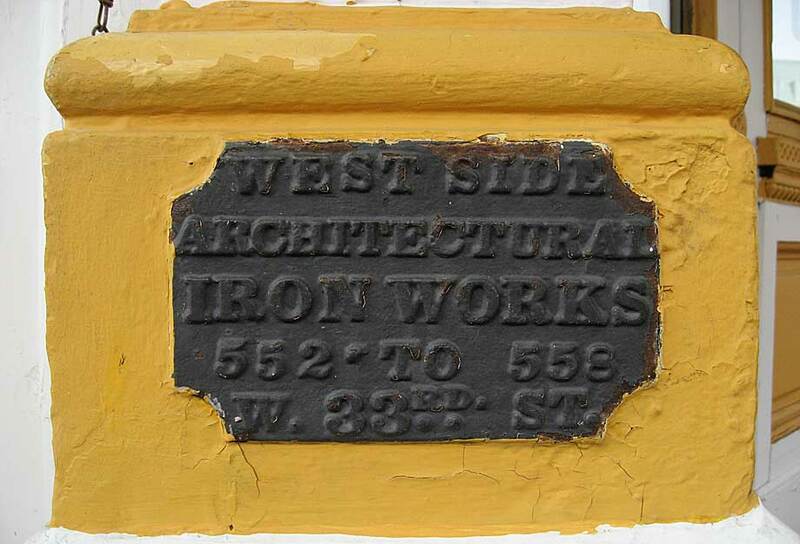 The West Side Architectural Iron Works were described as follows in New York's Great Industries. Exchange and Commercial Review. Edwards & Critten, editors and proprietors. Historical Publishing Co., New York & Chicago, 1885, "West Side Architectural Iron Works, A. J. Campbell, Proprietor, Nos. 550 to 560 and 553 to 557 West 33d Street; Office, No. 553 West 33d Street. - A leading house engaged in structural and ornamental iron work is the "West Side Architectural Iron Works" of which Mr. A. J. Campbell is the proprietor, and which was established some thirty years ago at the present location. A large number of hands are employed in manufacturing store fronts, girders, columns, lintels, beams and all kinds of building castings. A specialty is made of the celebrated 'Kalamein' ironclad wood-work for fire proof buildings. The works are very extensive and are admirably equipped with all the latest machinery and appliances. The following buildings have been erected with the iron work manufactured by the 'West Side Architectural Iron Works,' viz: Boreel Building, Lincoln Safe Deposit Company, Rev. Dr. Hall's Presbyterian Church, Hawthorne Flats, the building at No. 198 Broadway, A. C. Downing, Nos. 113 to 117 Fulton Street, O'Neill's Dry Goods House, James McCreery's Building, Nos. 22, 24 and 26 East 14th Street, New York County Bank, E. A. Jaffray & Co., the Sixth National Bank and a large share of railroad docks and buildings. With their finely appointed works, and the very best facilities at their command, they are producing a grade of manufacture fully equal, if not superior, to anything made in this country. Mr. Campbell is a resident of New York, was born in New Jersey, and is President of the Mechanics and Traders Exchange." Andrew J. Campbell (1828-1894) was elected to serve in the House of Representatives in 1894 but died before his term began: "Congressman-elect Andrew J. Campbell, the Republican who defeated Gen. Daniel E. Sickles for re-election to the House of Representatives at the last election, died at his home, in the Chelsea, 222 West Twenty-third Street, at 2:30 o'clock yesterday morning. His death was caused by acute Bright's disease, and he had only been in apparent danger for two or three days. He visited Governor-elect Morton last Friday at Rhinecliff, and is thought to have caught cold while riding in an open carriage from the railroad station to Mr. Morton's residence. At that time, Mr. Campbell was apparently in good health, but last Sunday night he was taken seriously ill. Drs. Shrady, Bates and Carleton held a consultation on Wednesday and diagnosed the case as acute Bright's disease. "Mr. Campbell was born in Newark, N. J., in 1828, and came from Revolutionary stock and Scotch ancestry. He was a Republican in politics ever since the foundation of that party. In 1856 he was elected to the Common Council, and afterward he served for six years as a Deputy Tax Commissioner. He was appointed Clerk of the Third Judicial District Civil Court in 1863, and served in that capacity for six years. He was elected to the Assembly from the old Ninth District in 1875, and served one term. He also served in the Department of Public Works as Superintendent of the Bureau of Supplies and Repairs. This was after Tweed's downfall. He was a member of the Merchants and Traders' Exchange for twenty years, and was its President for some time. "He was at the head of an extensive architectural iron business at 550 and 553 West Thirty-third Street." (New York Times, 7 Dec. 1894, p. 2). The information above leaves out a major element in this company's history. Andrew Campbell was not sole owner of the West Side Architectural Iron Works. Willaim H. Vantassel was a partner in the business from its inception, and outlived his partner by thirteen years. Vantassel (often spelled Van Tassel) was listed in New York city directories from around 1850 as a "whitesmith," and was in business with Hugh McGinley at 146 Perry St. from around 1855 until 1864. In 1863 Van Tassel & McGinley, 146 Perry St., were assessed $66.82 tax during the months March through August. In 1865 W. H. Van Tassel Co. at 400 West St. were taxed $71.06. Andrew J. Campbell seems to have become Vantassel's partner somewhere around 1867. This new business, intially called Vantassel & Campbell, was located at 400 West St. The foundry on W. 33rd St. started up around 1870. Wm. H. Vantassel & Co. were located at both 400 West St. and 558 W. 33d St. until the late 1870s. By this time yet another partner had joined the company. This was John Felter. Trow's Copartnership Directory of 1874 listed W. H. Vantassel & Co. at 400 West St. and 558 W. 33d St. The partners were William H. Vantassel, John Felter, and Andrew J. Campbell. Willaim H. Vantassel (1828-1907) can be found in the U. S. Census reports of 1860, 1870 and 1900. In 1860 he was a "house smith," age 31, born New York, living in New York's 9th Ward. His wife, Sarah, and son, William H. Van Tassel, Jr., age 7, lived with him. In 1870 he was recorded in both the first and second enumerations. In the first enumeration he was 42, born New York City, and again a "house smith." His wife, Sarah J. and son, William H. Jr., age 17, lived with him. In the second enumeration Sarah is named Jane. Probably she was Sarah Jane. Their address was recorded as 268 West 4th St., Ward 9, New York. In the 1880 Census I found William H. Vantassel, Jr., but not his father. William Jr. lived at 658 Greenwich St., age 28, and (again) a "house smith." In 1900 William Van Tassel, age 72, born New York, May 1828, a widower, boarded with Sophie A. Monroe at 242 West 4th St., New York. His occupation was recorded as "iron trade (old)." In 1907 William H. Van Tassel was listed as a trustee of the Society of Architectural Iron Manufacturers (along with luminaries such as J. M. Cornell & Thomas Dimond). I have not found an obituary for William Vantassel, but the following notice appeared in the New York Times, 28 May 1907, p. 9, "General Society of Mechanics and Tradesmen of the City of New York. Executive Offices, 20 West 44th Street. Brothers: Sorrowful announcement is made of the death of Brother William H. Van Tassel, on May 25, for twenty-five years a member of the society� "
This advertisement for the West Side Architectural Iron Works appeared in the Architectural League of New York's Catalogue of the Eleventh Annual Exhibition, 1896. An identical ad appeared in the catalog for the 1893 exhibition. In the Fourteenth Annual Report of the Factory Inspector of the State of New York For the Year Ending November 30, 1899 (1900) West Side Architectural Iron Works employed 110 males of whom 6 were under the age of 18. 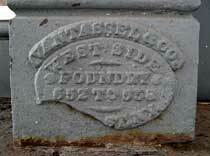 Both of these read: "Vantassel & Co. / West Side / Foundry / 552 to 558 / ... "